The last two weeks have been a little odd on the writing front. I’ve got two pieces of good news to report: First, Marrying Mandy is now available for pre-order. I want to again express my thank you to each and every one of you who nominated it while it was on Kindle Scout. The other good news is that I finished up the edits for my latest book, Finding Grace. This is the sixth and final chapter of the Love’s Compass series. I’m so excited about this book, not only because I finally get to share Beth and Tyler’s story, but also because I’ve been able to tie up some loose ends with regards to other characters in the series. Some of those stories have been on my heart since I first introduced them a year or two ago. I can’t wait for you all to read it! As you could probably guess from Finding Grace’s title, grace is a big thing in this book. Accepting the grace of God as well as allowing grace for ourselves. Because of this, I find it interesting that I’ve had to learn a lesson about giving myself some grace the last two weeks as well. You see, I have had a really difficult time starting a new project or really concentrating on much of anything. It’s weird, because I thought maybe it was strictly because of the time difference, lack of sleep, or maybe even allergies. 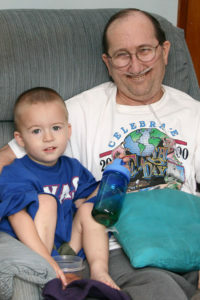 And then I figured it out: This month marks the sixth anniversary of my dad’s passing. It’s not that I’d forgotten. In fact, November is filled with memories of him. Dad and our son had birthdays just three days apart (November 7th and 10th, respectively). So I remember that last year how our son was so fascinated that his grandpa was going to have orange sherbet. I remember our weekly Skype visit a week later and how I thought my Dad was so happy and looked amazing compared to how he’d been looking and feeling in recent weeks. And then there was the 19th, the day he passed. So many things happened in such a short period of time. From the first of November through about the twentieth, it’s like my brain mentally goes through the events six years ago. That’s when I realized that I needed to give myself some grace. It didn’t matter if I couldn’t start another writing project right now, or if I just wasn’t feeling the holiday decorating bug. In fact, it really was okay to indulge in more Christmas movies on Netflix than I normally do or play the Facebook game I enjoy. Sometimes, when things are emotionally overwhelming, we just have to give ourselves the grace we need to get through that time in our life. As we go into the holiday season, I especially miss my dad, and I’m sure many of you experience the same thing. Enjoy those special memories, smile and laugh as you make new ones, and grieve the ones who are no longer with us. But also remember that you are not alone. Rely on God for peace and remember to give yourself a little grace. Finding Grace, the sixth book in the Love’s Compass series, will be released January 3rd, 2018 – three years to the day after the first book came out in 2015. If you haven’t tried the series yet, and you enjoy books that focus on faith, family, and love, then now’s a great time to start! Finding Peace is on sale for only $0.99 through November. Hugs, Melanie. Those anniversary months are tough. We all need Gods grace so much, and too often we forget to give ourselves grace, too. Hi! Thank you, I appreciate the kind thoughts and the congratulations! May His Grace and Peace wrap you in a warm hug. Thanks for the reminder that we can all give ourselves a little grace. I’m sorry for your loss but hope you and your family experience peace as you go through the holiday season. I appreciate that! I’m glad to have so many wonderful memories that make me smile as we go through the holiday season! ~Hugs~ I totally understand, as I miss my parents also, as well as others who I was close to. I have all these books in this series, and really want to get to them. I also helped nominate Marrying Mandy, and really enjoyed reading it. I’m thankful for you and your good stories!!! (((hugs))) to you, too, as you miss your parents and others who you think of this holiday season (and every day). Thank you for reading my books. I’m so glad you enjoyed Marrying Mandy and appreciate the nomination! My mom passed away November 5, seven years ago. This year was especially rough since I came so close to dying myself at the end of October. One of the words I’m focusing on in my recovery is “grace.” Giving grace to myself and those around me, as well as receiving it. The other words is “mellow.” If it isn’t a huge deal, I’m not going to make it into one. I’m practicing just letting things go that aren’t absolutely vital, so “whatever” (not in the sarcastic sense) is often in my mind! (((hugs))) to you, Valerie. I’m sorry for the loss of your mom. I’m also sorry for what you went through and continue to pray for healing and strength. 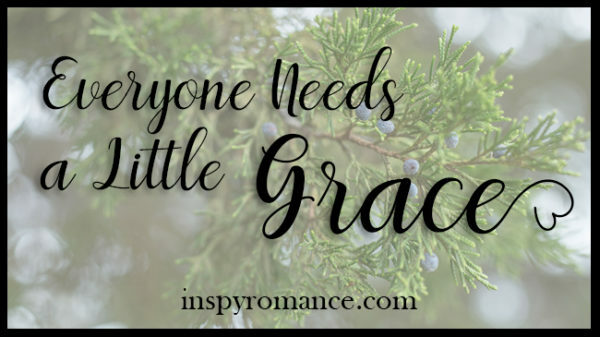 I like your focus on “grace” and “mellow.” I especially need to remember that about how, if it’s not a huge deal, I don’t need to turn it into one. Blessings to you this holiday season. Hi Melanie! Grace to you, and all the wonderful authors and readers of Inspy Romance. As we age, start looking at our mortality; we realize how important grace is. Those empty seats at our table are definitely more visible during the holidays and winter months. Since the birth of our granddaughters (2013 & 2017), i often wish that my mom were around to tell me stories about my toddler time. Often difficult to believe she passed 10 years ago / my dad 3 years ago. While eating Thanksgiving Dinner yesterday, saw a cardinal. My mom’s favorite bird. The legend goes that when one sees a cardinal, a loved one is near and watching over us. This cardinal has been nearby a lot this year. Grace – need to feel mom’s presence. Best wishes to all, as we begin the Advent season. So much to be THANKFUL for – health, family, roof over our heads, food on the table, and a lovely red cardinal gracing the family with its presence. I’m glad you have those memories of your mom and dad. I know it’s hard to go into the holiday season without those loved ones, especially when you think of the things or stories you’d love to hear again. I love that about the cardinal, how neat you’ve been seeing them a lot this year. You are right, there is SO much to be thankful for. I pray for peace, grace, and wonderful new memories for you and your family. I hear you. It’s totally fine to indulge in sweet movies and books when we’re sad and grieving. November is a special month in our family too. We would celebrate my grandfather’s and my birthday. He passed away in 1989! Hugs to you and Happy Holidays! Melanie, we absolutely must extend grace to ourselves! If we don’t, we can get overwhelmed in the details, at least I know I do! I pray peace & comfort to you during this time of year. It can’t be easy losing someone that close to you and the holidays can intensify the feelings. Thanks for sharing your heart with us!